General Khalifa Hifter (all stories➚) is a poison in Libya. In the first half of last year, the former “Virginia resident” tried to lead two failed coups against the elected, Islamist-led government in Tripoli (see our coverage here and here), and he unilaterally launched a bloody, unprovoked, and unauthorized military assault — called “Operation Dignity” — against Islamist-aligned militias in Benghazi. Not only did the operation essentially fail to achieve any sort of purge of purported Islamic terrorism from eastern Libya, but I believe that it was a major factor in the uprising that followed the election of the new secularist government later in 2014. Unlike in Tunisia, which saw a smooth transfer of power from Islamists to secularists and had not seen security forces crack down on Islamists before the elections, Libyan Islamists had good reason to fear that a government aligned with Hifter (yes, elected, but under disputed circumstances and for possibly the last time) would pose an existential threat to them. It is quite possible that without Hifter’s ill-advised and ill-conceived unilateral coup attempts in western Libya and counterterrorism offensives in eastern Libya, Islamist militias would not have seized power in Tripoli and Benghazi in the second half of the year and proclaimed a rival government composed of the remainder of the previous government, which he had tried to overthrow. General Hifter is not even well-liked among many secularists and members of the more recently elected (and internationally-recognized) legislature and cabinet now stationed in Tobruk, near the Egyptian border. He doesn’t respect them either, as far as anyone can tell, despite their international recognition and democratically elected status. He is as deeply anti-democratic as he is anti-Islamist (which, again, I would argue is one reason the Islamist uprising occurred: fear of his illiberalism and targeted hatred of political Islam). Nevertheless, the elected officials have been unable to to get rid of him, even under heavy pressure from Egypt’s military government — which supports his anti-Islamist aims but not his incompetence. 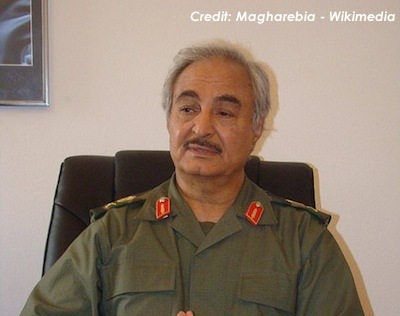 And that last word — “incompetence” — is the other thing it’s important to remember when considering how he poisons Libya: General Khalifa Hifter is not even good at his self-appointed job. It might be another matter — perhaps — if he actually achieved results or had decisively ended the threat of civil war in Libya. Instead, he stirred war up in the first place and then repeatedly botched things. Simply put, he doesn’t win offensives. First we have the two failed coups and the failure of Operation Dignity to deliver a death blow in Benghazi. But then, as I documented in November 2014, there was the spectacularly disastrous campaign wherein Hifter’s forces represented a full 80% of all casualties in Benghazi in a one-month span, even including civilians and fighters supporting the rival government. Then, over a month ago as I write this, General Hifter claimed an invasion of Libya capital was imminent. Guess what happened next? Nothing. Surprise! He is not some kind of military mastermind or savior of the nation. He is a self-interested, poisonous man — and a foolish one at that. General Hifter is the type of person who takes a stick to a wasp nest and is then puzzled when he is stung brutally by thousands of wasps. Then, after recovering, he just hits it again. Dignity restored! Troops loyal to a Libyan general tried to block internationally recognized Prime Minister Abdullah al-Thinni from visiting the eastern city of Benghazi at the weekend as he looked to show support for his soldiers battling Islamist groups. Army members under the control of General Khalifa Haftar tried to deny Thinni’s plane permission to land on Sunday and later briefly halted his convoy during the visit, a minister and military officials said on Monday. Haftar’s spokesman Mohamed El Hejazi did not confirm the details but accused [Prime Minister] Thinni of having visited Benghazi without permission. To recap the implications there, that means General Hifter does not accept Prime Minister Thinni as his commander-in-chief and that Thinni must ask permission of General Hifter to do things. There are also now reports (video here) that his followers have imposed a 24 hour deadline for the House of Representatives to fire the civilian cabinet and install a military junta led by Hifter. No wonder the opposing faction was furious about the government being moved “temporarily” from Tripoli to Tobruk: It’s now sitting there for the taking by the secular-militarists following General Hifter, if they decide they want it.﻿ They just have to reach out and take control. Overthrowing the internationally-recognized government he already practically holds hostage might be the only successful military action Khalifa Hifter ever undertakes. It will not, however, make Libya a better place — or even just more stable — by any possible measure. Tagged Benghazi, Khalifa Hifter, Libya, North Africa.